We, humans are polymorphic individuals with different shapes, sizes but with the same origin. All of us are formed by the fusion of two cells called the “ovum” and the “sperm cells”. Thus only two cells are responsible for creating a whole organism. This concept has laid a foundation for the golden era of Regenerative Medicine. In this era owing to the vast advancements in the cellular biology, we are on the verge of exploring “Biological solutions to Biological problems”. These stem cells are unspecialised cells with an extra ordinary ability to self renew and are capable of differentiating into tissue specific cells of the body. When called for an action by the body at the time of injury these cell undergo division giving rise to one daughter cell and one progenitor cell which is an intermediate committed cell type formed before it fully differentiate into specific cell type. Totipotent – the ability to differentiate into all possible cell types. Examples are the zygote formed at egg fertilization and the first few cells that result from the division of the zygote. 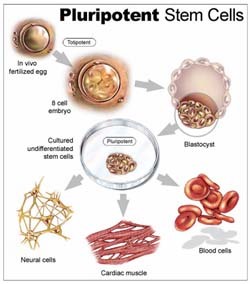 Pluripotent – the ability to differentiate into almost all cell types. Examples include embryonic stem cells and cells that are derived from the mesoderm, endoderm, and ectoderm germ layers that are formed in the beginning stages of embryonic stem cell differentiation. Multipotent – the ability to differentiate into a closely related family of cells. Examples include hematopoietic (adult) stem cells that can become red and white blood cells or platelets. Oligopotent – the ability to differentiate into a few cells. Examples include (adult) lymphoid or myeloid stem cells. Stem cells have three unique characteristics which make them vital for normal wear and tear of the body. Firstly, they are undifferentiated cells capable of giving rise to any tissue specific cells. Secondly, they are capable of prolonged self renewal having unlimited life span and thus maintaining their number intact. Thirdly they are able to trigger secretion of certain hormones and growth factors at the site if injury to facilitate damage repair. These cells are able to regenerate damaged organ systems of the human body through formation of new cells within the system itself e.g. hematopoietic stem cells are adult stem cells replenishing all blood cells. These stem cells accelerate the production of blood cells by creating microenvironment full of hormones and growth factors. Thus in other words stem cells are promising candidates for 3R’s i.e. Repair, Regenerate and Rejuvenation. For quite some time scientists have investigated the role, these stem cells play in regenerating the tissues of those systems. In the last decade, new pathway has paved for the people who have lost hope with the conventional treatment for dangerous and debilitating diseases. Scientists have been able to derive stem cells in the laboratory that are not specific to particular organ systems. These stem cells are isolated from your own body to reduce the chances of rejection and other opportunistic infections after again putting back into your body. With the great migration and homing capacity these cells reside in the targeted area to start the process of regulation.